We are pleased to announce that PostgreSQL 11, along with PostGIS 2.5 and PgRouting 2.6.x are now available on all PostgreSQL, PostGIS, GeoServer, and AcuGIS Suite hosting plans. As always, we will continue to support PostgreSQL 9.x and 10.x as well as earlier versions. The Enterprise Suite is based upon our experiences in providing GIS Hosting services, as well as feedback and suggestions from customers. The Enterprise Suite provides a complete Open Source GIS solution without locking in users. Canvas can be used to create maps from multiple data sources as well as virtually any WMS data source. In keeping with our philosophy of providing fair and transparent pricing, the Enterprise Suite starts at only $55 per month. We’re very happy to announce the release of our new Open Source project; GeoHelm. 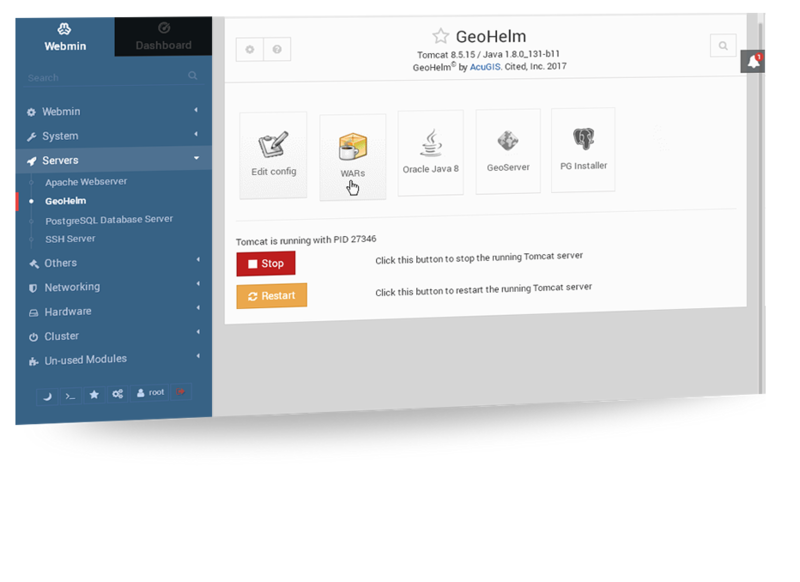 GeoHelm is a Webmin module that installs, configures, and manages a complete Open Source GIS stack. It provides users of all skill levels with easy set-up and browser-based management without locking the user into a particular solution. You can even delete the module itself and all components will continue to operate normally. All software installed is the latest stable version direct from the provider (Apache Tomcat, Java, PostgreSQL, PostGIS, PgRouting, and GeoServer). The idea of GeoHelm is based upon our experience in administration and is intended to help address what we believe are some of the main barriers faced by users of various skill levels. For those new to GIS, it provides an easy to install and easy to use interface to get going with Open Source GIS. For more experienced users it minimizes the amount of time and effort required to go to production. For developers, it can help to address the most common issue we found when developers go to production, namely; “It worked on my laptop…..”. While GeoHelm is not an IDE (or seeking to become one), because it installs latest, unmodified versions of all software, it is the same software that will be used in production. No surprises. Equally important, it installs the software on production Operating Systems, not in a container or pre-built installer. GeoHelm is supported on CentOS 7, Debian 8 and 9, Ubuntu 14 and 16, Fedora 24 and 25, and Scientific Linux 7. For full documentation, please visit geohelm.org. A Quick Start guide can be found there as well.